Ever since the end of its long civil war, Liberia has had to struggle to fix its broken education sector. Public and private efforts have been marshaled against this gargantuan challenge. But the challenge remains. However, Liberians are not perturbed and one of such who have made a commitment to see the country though this difficult period is Domfah Academy and Professional Institute (DAPI). Established in 2012 as part of a social not-for-effort of Domfah General Enterprise based in Switzerland, the school has picked up successfully. Last September it provided an opportunity for learning to more than 280 kids in the New Life Community in Johnsonville, an indigent township just outside the Liberian capital, Monrovia. 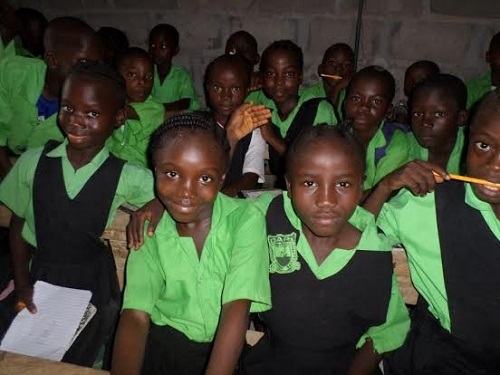 “In Domfah we believe it is only through education that children can achieve their full potential; by helping themselves, their families and their own community, they can assure Africa and Liberia’s progress”, the school says on its website, expressing a deep commitment that it wants Liberian children to reach their full potential. DAPI’s mission is also to provide excellent care and education that will improve the community’s living condition, to support growth and development of a people in need through education. To make this happen DAPI opens its arms to partner with organizations so that its programs can reach a higher number of community members in order to promote an expansion that will fit properly with the needs of the community. The challenge is huge but Ishmel Kromah and Domfah General Enterprises are determined to see it through. The plan is to upgrade DAPI to a full high school ( 12th grade level) next year. One of the recent initiatives of the school is the announcement of a youth competition on water, sanitation and hygiene. Any young Liberian between the age of 15 and 20 is eligible to submit an entry. DAPI hopes to pique their interests in the issues of the provision of clean water and proper sanitation to cities and villages and promote public hygiene. Participants are required to chose a topic in the competition area and do a personally-researched paper of about 12 to 15 pages and submit it to the school by the 1st of April. And be ready to do an oral presentation in front o f a jury between April 14 and 18. The winner will receive a prize of a brand new laptop computer and the possibility of representing Liberia in an international competition. The runners-up will also have the chance to participate in an international competition and win a tablet while the third placed winner will walk away with a year’s scholarship at DAPI.